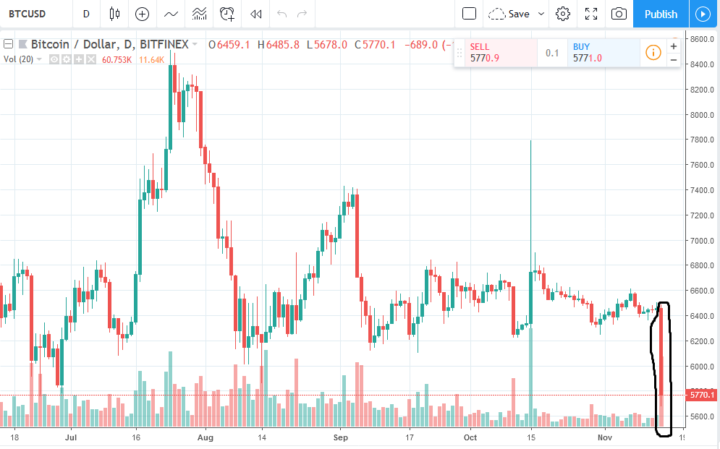 Bitcoin (BTC) fell by more than 11 percent on Wednesday to reach its lowest level since October 2017. This sudden fall comes after months of contracting volatility leading to a prolonged period of sideways trading and stability. Presently, numerous theories are circulating as to why the top-ranked cryptocurrency has taken such a nosedive. Looking at the chart below, one can easily make out the massive “death candle” that took the price of Bitcoin all the way down to $5,600. This is the second time that the top-ranked cryptocurrency has fallen below the psychological $6,000 price mark. BTC is now at its lowest point in over a year. The price crash began with a minor drop that occurred in the late morning period (UTC). However, by mid-afternoon, BTC took a massive slide in a few hours to fall well below the $6,000 mark. Presently, there isn’t any consensus as to the reason for the sudden price crash. However, there are some theories as to what might be responsible for the fall. These include whale manipulation, bear market breakout, and pressure from the upcoming Bitcoin Cash hard fork. The market had been entering a wedge, with the volatility so low. What you are seeing low is a breakout on the downside. Sometimes when things happen, it takes a while for the true reason to become clear – an exchange trade or regulatory action. Since Q2 2018, BTC maintained a range-bound trading range. During this period, its volatility fell to the lowest level in more than two years. However, despite this stability, many technical indicators pointed to the emergence of an imminent breakout, albeit without stating in which direction. Given Wednesday’s event, it is apparent that the breakout is a bearish one which plays into the forecasts provided by BitMEX’s Arthur Hayes. Earlier in the year, the BitMEX CEO predicted that the top-ranked cryptocurrency would test $5,000 before the end of the year. Apart from BTC, the altcoin market is also experiencing similar colossal dumps. All top-ten altcoins are presently in the red as massive selloffs dominate the market. As at press time, Ethereum, the second-ranked cryptocurrency by market capitalization is struggling to stay above $180, falling more than 14 percent. XRP is also another casualty of the market selloff, falling by more than 12 percent. Outside the top ten, the story is the same for the likes of DASH and IOTA both of which were enjoying stellar runs before the crash albeit unable to break their respective 50-EMA. Even recent highflyer Etheera (ETA) which recorded more than an 80,000 percent increase over the last fortnight is down by more than eight percent. Image courtesy Shutterstock, Tradingview, Coinmarketcap, and Coin360.